Tuesday night saw the return of hockey to Capital One Arena for the first time since game 4 of the Stanley Cup final, as the Bruins were in town for game 2 of the 2018 preseason. (Game recap here.) You can review our Game 1 prospect grades right here. This game 2 review covers Capitals prospects (non-roster players), and does not include players who were on the Capitals roster at the end of the 2017-2018 season. (Nicklas Backstrom, T.J. Oshie, Dmitry Orlov, Matt Niskanen and Braden Holtby). If a prospect doesn’t have a summary below, there was nothing significant to report. It should be noted that the Capitals opponent, the Boston Bruins, started a very young and inexperienced lineup, as most of the stars and veterans were still in China for exhibition games against the Calgary Flames. 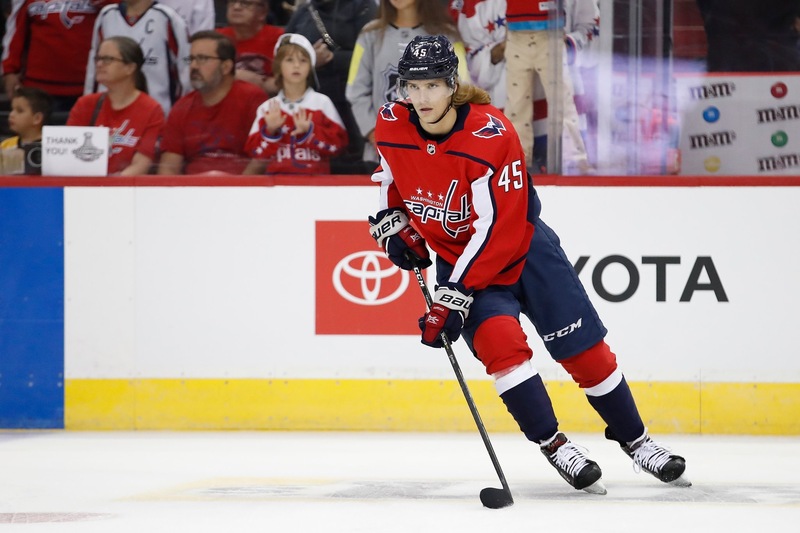 Ilya Samsonov – Samsonov made his first (official) appearance at Capital One Arena Tuesday night. Samsonov struggled a bit in the first game of the Prospect Showcase in Estero last week, but settled down nicely in the second game, ultimately pitching a shutout against the Lightning prospects. (Here.) Tuesday night he entered the game midway through the middle frame and gave up a goal 10 seconds later at 8:56, the Bruins first and second shots of the period. Samsonov stopped the initial shot on a breakaway, but Senyshyn gathered his own rebound, finishing with a backhander. Samsonov would give up a second tally late in the middle frame after a mad scurry in front of the Capitals net. There was little Samsonov could do, as Caps defensemen Colby Williams was driven into Samsonov just prior to the score. This entry was posted in News and tagged 2018 Preseason, Alexander Alexeyev, Axel Jonsson-Fjallby, Connor Hobbs, Ilya Samsonov, Jon Sorensen, Kody Clark, Lucas Johansen, Max Kammerer, Riley Barber, Riley Sutter, Shane Gersich, Travis Boyd. Bookmark the permalink. The rookies standing out the most were Barber and Alexiev, perhaps because of that first goal. Alexiev really has a booming shot. Jonsson-Fjallby looked speedy and he and the gang seemed to create tons of chances. The Caps seems to lack finish tonight and could not take advantage of their power play opportunities. (They were looking like the Bill Peters’ era Carolina Hurricanes who would generated tons of chances but lack finish.) Some of that will probably be corrected when people have more stable linemates, whether in DC or in Hershey. And they seemed to give up too many breakaway opportunities, resulting in goals against both Holtby and Samsonov. Alexeyev was the most surprising to me. 18 years old and he didn’t look out of place at all. Very physical player too, was knocking people around. Also glad to see Barber have a game he’s been trying to produce for some time now. Who knows, maybe he takes a step this season. Interesting perspective, Day One, hadn’t thought about it like that before. And I agree, this current group of baby Caps is quite different than years past. Speed being the most notable to me. Gersich, Axel, etc., have blazing speed. It will be interesting to see how quick they can make an impact, both in Hershey and eventually with the Caps. I think some of these grade were a touch too high. Hershey’s D is going to need some work this year again. I agree with DD Barber and AA were far away the best of the young ones, especially Barber his AHL experience showed through. Johansen was a bit disappointing. Fair point on your part, “anonymous”. The grading reflected specifically on how they played in last night’s game, and not how they will fare in Hershey or with the Capitals.